From fixing things in his father’s workshop as a child to playing themes from Star Wars and Harry Potter at 100,000 volts, MEng (Hons) Electrical and Electronic Engineering graduate Max Simmonds has made remarkable progress. 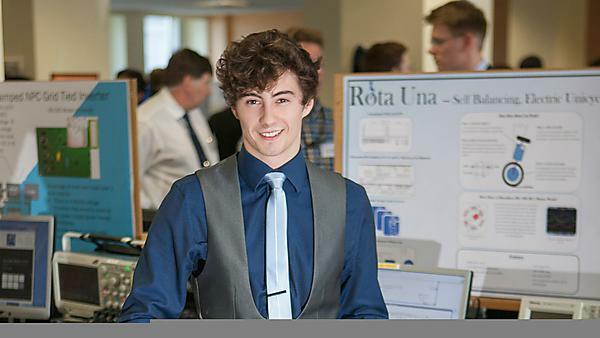 This ambitious young engineer has worked with some of the biggest names in the industry, and will continue to refine his talent with Plymouth University. At the age of just 22, Max’s achievements have already been recognised by the engineering industry, academia and the government alike, leading to his nomination as one of The Manufacturer’s Top 100; a prestigious list of exceptional individuals in the UK. This was followed by a year on a work placement with National Instruments (NI), providing hardware and software to some of the most prominent engineers and scientists around the world. Back on terra firma, Max cites the creation of his innovative musical Tesla Coil as the highlight of his time with NI – the end result being electrifying renditions of Star Wars’ Imperial March and Hedwig’s Theme from Harry Potter. This was merely one of a long list of achievements that include participating in the Met Office’s International SpaceApps Challenge; designing and building his own 3D printer from scratch, and even helping to present the Royal Institute Summer School 2015, hosted by Professor Danielle George and Professor Brian Cox. Max believes the Plymouth approach set him up for success, and he is set to complete his Masters here, but not before heading to Switzerland for a work placement at CERN in Geneva. He said: “I chose Plymouth simply due to the amount of practical work that the students did – I attended the open days and the final year project showcase before I applied. Plymouth stood out for me because almost everything you have learnt in theory is backed up with a practical lab. Max Simmonds wrote a computer program using National Instruments’ LabVIEW platform to accurately control the frequency of the sparks, creating precise musical notes as the spark heated up the surrounding air.